Ever since Herbivore Botanicals hit the beauty scene, we’ve been intrigued. Apart from being completely natural, the brand has a clean, minimalistic aesthetic that really speaks to our millennial hearts. 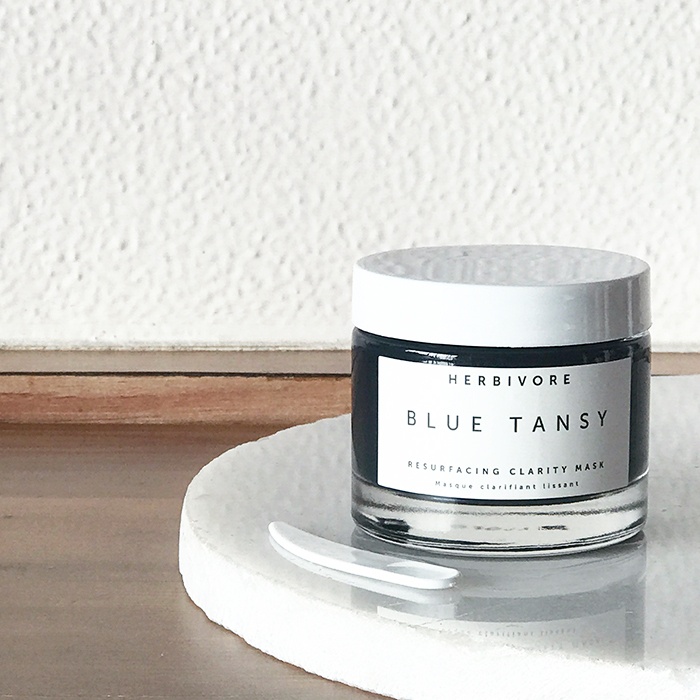 Since we’re kind of obsessed with masking, we decided to test out the Blue Tansy Resurfacing Clarity Mask. Here is our review. The mask comes in a clear, glass jar with a no-nonsense label on it. Although we general dislike such kind of packaging as it isn’t the most hygienic, the brand did remedy the situation slightly by providing a tiny, plastic spatula to help with the application. A list of all the ingredients is mentioned on the accompanying box, along with the directions for use. As instructed, we applied the mask on to our clean skin and left it on for about 15 minutes. The product has a runny, gel-like consistency and feels slightly tacky as it dries down. Although the product does look blue in the tub (thanks to the star ingredient i.e. blue tansy), it goes on transparently – unless you really pack it on. The good part is that only need a thin layer to feel it working. Whilst those of us with sensitive and dry skin did experience a fair amount of tingling, our oily-to-normal colleagues barely felt a zing at all. On the downside, it does have a strong, herbal fragrance to it which can be a deterrent. Since a bunch of us tried out the mask at the same time (we counted it as a team-building activity), we were able to gauge the results of different complexions simultaneously. Thanks to the presence of all those fruit enzymes, the formula did make our faces look more radiant and feel softer. However, it did not have any effect on acne, redness or blackheads. Considering that it contains white willow bark, which is high in salicylic acid, we were expecting a bit more bang for our buck. The brand suggests using the mask every other day for 5 days, and then tapering down the application 2–3 times per week. Honestly though, this recommendation felt too strong for those most of us. Out of the brave ones who did persevere, 2 landed up with a smattering of red, irritated bumps, whilst the others sported a smoother and more luminous complexion. In our opinion, this is the mask to try when you have big event coming up and want an instantaneous glow. If you are worried about the effect it will have on your skin, do a patch test first or leave the mask on for just 5 minutes.